Hi Rose, Peace to you from Minnesota! best peace blessings to you. A great quote for Blog4Peace Day. And a great graphic. Beautiful, may you be blessed with peace today and always, may it be so for all beings. A beautiful and inspiring post. Thank you. Peace to you and yours today and every day. Indeed. Beautiful flowing words filled with love. May Peace be with you, forever and a day. Wonderful image; wonderful message. This is my fave day of the year to be a blogger. Beautiful! Peace, Love & Light to you! I feel like I want to read your beautiful words over and over. They are very deep,,, and I feel them in my heart. Peace to you.,, peace everywheres. Love your post, we join you in blogging for peace. Dona Nobis Pacem. Beautiful. Peace to you from Sicily. 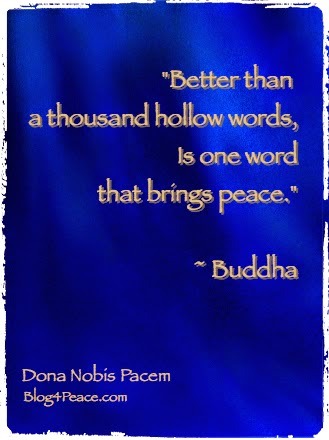 We all need more peace! Love the poetry, love the vibe, love the earthiness, love the peaceful way you walk everyday. Thanks for inspiring us, Rose. Peace to you and yours, Rose.